Well, the blog has been pretty quiet this week. I've done a few reviews, but nothing else because I've been so busy with other things and didn't really have anything to blog about. I just have a few random things to talk about today. My current work in progress is coming along nicely. I passed the 25,000 word mark yesterday, and I'm happy with where it's going so far. My characters have already sort of developed minds of their own and have taken over, and now I'm just enjoying the ride. I haven't told anyone any details yet, but hopefully soon I can start revealing bits and pieces, and maybe even posting teasers. There are still a few ebook giveaways for Blue Sky Days going on as part of the tour. I'm also giving away a copy as part of Project Tell Taylor, and I'll be offering a copy in the I <3 YA Giveaway Hop, which starts on Valentine's Day. 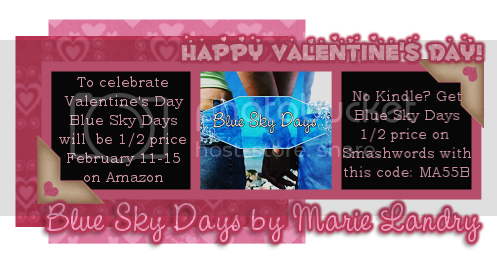 To celebrate Valentine's Day, love, and romance, I'm having my very first sale for Blue Sky Days. From today until Wednesday February 15th, the book will be half price ($1.99) on Kindle and Smashwords. The Kindle version is already discounted on its own, but if you don't have a Kindle and want to buy the book from Smashwords (available in all e-formats), just use this code: MA55B and you can get the book for half price. I'd greatly appreciate any help in spreading the word about this sale! Valentine's Day Blogging Event - Who Do You Love? I think that's it for me today. I'll be back tomorrow with my IMM, and will hopefully have a regular blogging schedule this coming week. I'm reading Daughter of Smoke and Bone by Laini Taylor right now and loving it, so I'll probably have that review up for you guys later in the week. Have a great Saturday! What are you up to this weekend? Daughter of Smoke and Bone is an amazing book. I'm so thrilled that a writer/agent/editor went with such a literary YA fantasy ms.